Partly cloudy skies early then becoming cloudy with periods of rain late. Low 52F. Winds SSW at 5 to 10 mph, becoming WNW and increasing to 15 to 25 mph. Chance of rain 60%. A Nebraska Department of Environmental Quality representative, right, speaks with a landowner during a hearing on the Keystone XL pipeline at the Boone County Fairgrounds in Albion Wednesday. ALBION — If you were looking for an opinion on TransCanada’s proposed Keystone XL pipeline, the community center on the Boone County Fairgrounds in Albion was the place to find it Wednesday. 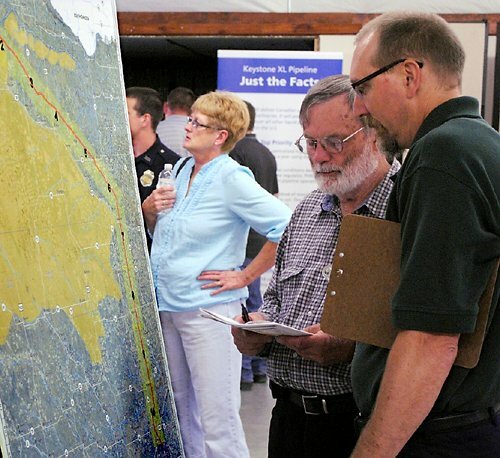 More than 160 people attended the third of four public meetings scheduled by the Nebraska Department of Environmental Quality (NDEQ) along a segment of the new pipeline route. The meetings, which conclude today in Central City, were called as a way to shed light on the project and give citizens an opportunity to provide feedback on the controversial pipeline. Mike Linder, NDEQ director, said it’s the first step in a six- to nine-month process before a recommendation on TransCanada’s modified 173-mile Nebraska route is presented to the governor. In April, the Canadian pipeline builder submitted a new route to the state after a backlash of concerns over possible soil erosion and contamination of the Ogallala Aquifer in the Sandhills area. The 2,000-foot-wide corridor was the main focal point at Wednesday’s meeting as attendees carefully studied plat maps depicting its path. “The corridor that they’ve submitted does avoid the Sandhills area, as we’ve defined it,” said Linder. 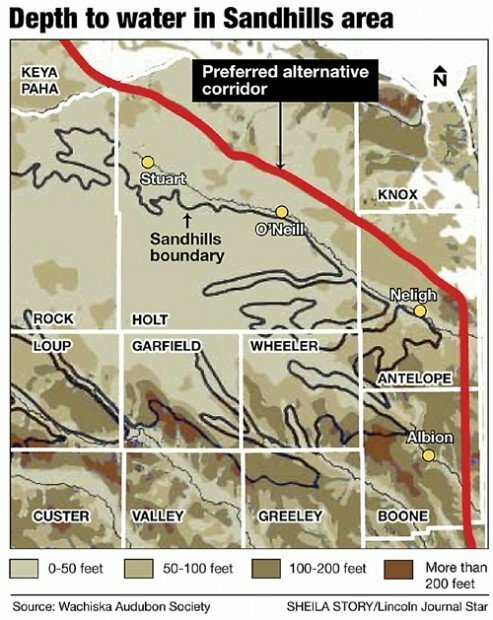 That corridor, which will likely be narrowed by TransCanada this summer or fall before the NDEQ further studies any environmental, economic, cultural or social impacts, now skirts the eastern edge of the Sandhills, cutting through eastern Boone and Nance counties before reconnecting with the original route near Central City in Merrick County. The 854-mile, 36-inch diameter pipeline that would carry 700,000 barrels of oil a day from Alberta, Canada, and the Bakken oil field in Montana and the Dakotas to refineries in the Midwest and along the Gulf Coast is currently slated to cross land owned by Ray Prothman’s son about three miles east of Albion. While his son has some concerns, Prothman, who lives between Albion and St. Edward, believes it’s important to remain open-minded. “Who knows what benefits you’ll see,” he said. Another landowner, Nick Gasper, had an even stronger opinion about a pipeline he’d be glad to see built. “You’ve got to weigh the risk against what you’re going to gain,” said Gasper, whose ground near St. Edward would be crossed by Keystone XL. Gasper said “scare tactics” are shadowing the pipeline’s benefits, which include energy security and local tax boosts. “I’d rather buy (oil) from Canada than from Iran,” he said. Perhaps the most vocal at the public meeting were representatives of several special interest groups. Barry Rubin of Nebraskans for Jobs & Energy Independence said his group is backing the project because it would improve the nation’s oil supply and spark economic growth in the state. TransCanada estimates more than 7,000 construction jobs will be created along the route from Canada to Steele City. “It’s an important project,” Rubin said. “This is by far the safest way to transport oil,” said Ryan Scott, senior policy director for the Consumer Energy Alliance. Scott expects the Keystone XL pipeline to lower oil prices and provide more security over Middle East sources. “They have the power to turn the spigots off and they have in the past,” he said. But not everyone favored the new route. Ken Winston, policy advocate for the Nebraska Sierra Club, said there are still concerns about the high water table and possible contamination of the aquifer. Outside the community center, members of Energy Citizens, a self-proclaimed grassroots group in support of the pipeline, were handing out bottled water and pizza to attendees. Laurie Lee, the group’s spokeswoman, said 85 percent of the people they’ve talked with at the three public meetings favor the Keystone XL project. “The consensus is pro. The challenge is most people who are for it are less likely to be vocal,” said Lee, who is the director of grassroots for Arkansas-based Southern Meridian, a public affairs and political consulting firm behind Energy Citizens. Lee said Nebraskans see the benefits Keystone XL would bring to the area, despite misinformation being spread by pipeline opponents. And one didn’t have to go far to find these opponents. Steps away from the Energy Citizens table, members of Bold Nebraska had gathered. Jane Kleeb of Bold Nebraska called the Keystone XL pipeline a “recipe for disaster” that poses environmental risks, infringes of landowners’ rights and won’t do anything to improve the country’s energy security. “There is no reason why we should have this pipeline running in our state,” she said. Bold Nebraska is currently working to form a coalition Kleeb said will protect landowners by drafting a standard contract to use when negotiating with TransCanada. Jeff Rauh, a spokesman who was part of a TransCanada team on hand Wednesday, said the company plans to begin contacting landowners soon, seeking permission to conduct surveys along the proposed route. The goal, he said, is to evaluate the land and identify any issues or potential impacts on landowner operations. There is no timeline for easement acquisitions along the new route to begin, according to Rauh, who believes the public meetings are helping improve Nebraskans’ receptiveness for the pipeline. “I get the sense that there’s comfort in the fact that there’s a state entity reviewing it,” Rauh said.